Invisalign is an alternative to traditional braces that has been gaining popularity for years with the thousands of patients in Canada who have experienced it first hand. Invisalign replaces traditional braces with clear, custom made plastic aligners that are changed every two weeks to correct crooked teeth, remove gaps and improve a patient’s bite. Invisalign offers several advantages, including the invisible look that it’s name implies. You can remove Invisalign for meals and eat what you want, you can brush and floss and chew gum. 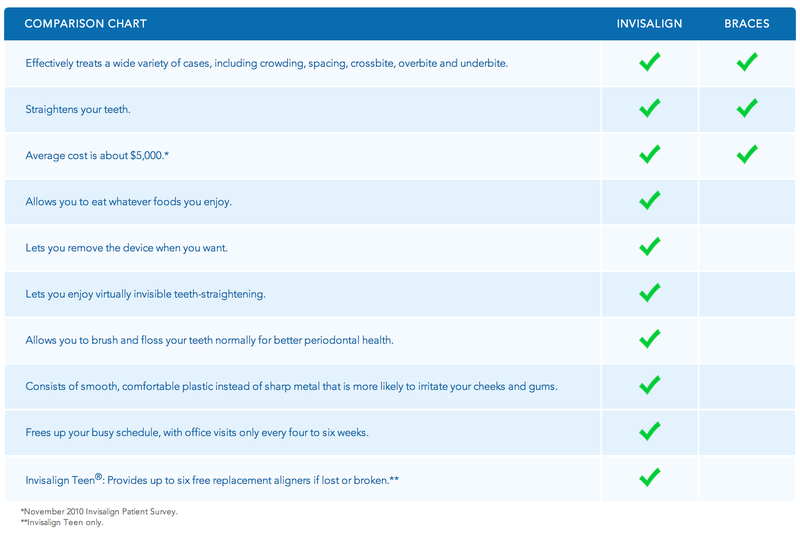 Invisalign can help teens and adults and is covered by many insurance plans for teens. To learn more about Invisalign, speak to your local 123 Dentist office for a consultation. Beginning in October, 123 Dentist Member Clinics are offering patients $1200 in savings off Invisalign, making it more affordable than ever before. If you’ve been considering Invisalign for a minor or major correction, now is the time. This promotion is only on for a limited time and is available at select clinics, so call today for more information. Sometimes traditional braces are necessary for severe corrections, and they are still recommended by many of our dentists in certain cases. They can also offer a more affordable solution to patients without insurance or limited budgets. They also come with some baggage, like tooth decay caused by an inadequate ability to brush and floss while wearing them. They can irritate gums and cheeks of patients and cause plaque build-up in hard to reach places. You’ll have to avoid some of your favourite foods when wearing them too, like hard crusted breads, chips, nuts, some candies and many hard fruits and veggies. Gum and toffee are a no-no, so is popcorn. Finally, the biggest reason people dislike braces is the way they look. If you’re a teen or young professional, it’s hard to smile and be yourself with a mouth full of metal. Invisalign solves all these issues. Let’s take a look at some of the ways Invisalign can improve your smile. Do you have a smile like one of these? If so, talk to a 123 Dentist now to build a custom treatment plan that is right for you. Find out more about treatable cases and take a FREE smile assessment on Invisalign’s website here. These stories and opinions are those of the individuals in the clips and do not necessarily reflect the opinions of dental professionals. They’re included below as real Invisalign patients who have posted their opinions online. We didn’t find any language or suggestive materials in the clips below, but please note that these videos were not made by 123 Dentist or our members. Treating orthodontic issues, particularly severe bite issues or crooked teeth is important. Left untreated many patients can experience larger problems over time. Speak to a dentist today to find out if you could benefit from Invisalign. Our dentists will recommend the best option for you, and if you can benefit from Invisalign, remember to take advantage of our $1200 savings while you can!